Hi, I’m Jennifer Harris. 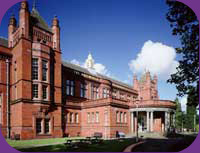 I’m Deputy Director at the Whitworth Art Gallery, which is part of The University of Manchester. My special area at the Gallery is Textiles. I take care of the collection of textiles that we hold there and organise exhibitions about textiles. How did I get into Textiles? When I was at school history was always one of my favourite subjects, and I was particularly interested in the history of everyday things – the clothes that people wear and what their houses looked like. So I then went on to study the history of art and design at university. I like the fact that textiles surround us from the moment we are born to the day that we die, and that all the world’s different cultures make use of them. We have a huge collection of textiles at the Whitworth Art Gallery that has been there since the Gallery first opened over a century ago, in 1890. It is one of the most important collections in Europe. There are more than 16,500 objects and the collection is still growing! We buy textiles from artists and designers working today and members of the public sometimes present us with precious textiles that they’ve inherited or collected. There are textiles from all over the world, from all five continents, and the oldest textiles date from Roman times.